Due to this constraint, most customers would have to go out their way to capture this information on initial deployment and either store that in a log file or persist that into their CMDB system. As a customer, I also took a similiar approach where I ended up storing the original provision date in our CMDB which can be consumed by our other internal tools. In addition, I also created a Custom Field for each VM where this information was also readily available which came in handy for quick reporting using the vSphere API. So going back to our initial finding, if you are a VMware Cloud on AWS customer, when new VM is created using either the UI (Flex/H5) or API (PowerCLI, etc) the new createDate API property will automatically be populated with the creation date of the VM. As of right now, this property is only visible through the vSphere MOB as this property is not available in any of the existing vSphere SDKs including PowerCLI. However, if you wish to leverage this new property, I did put together a quick PowerShell/CLI script called VMCreationDate.ps1 which remotely calls into the vSphere MOB and parses out this value. Although this new API property is currently only available to VMware Cloud on AWS customers, hopefully it is a preview to what is to come in the future 🙂 I know I definitely would appreciate having such a field that is persistent with the life of the VM without relying on Events database, what do you think? great news and thanks for sharing, William! I’d definitely like to have this property within vSphere as well. 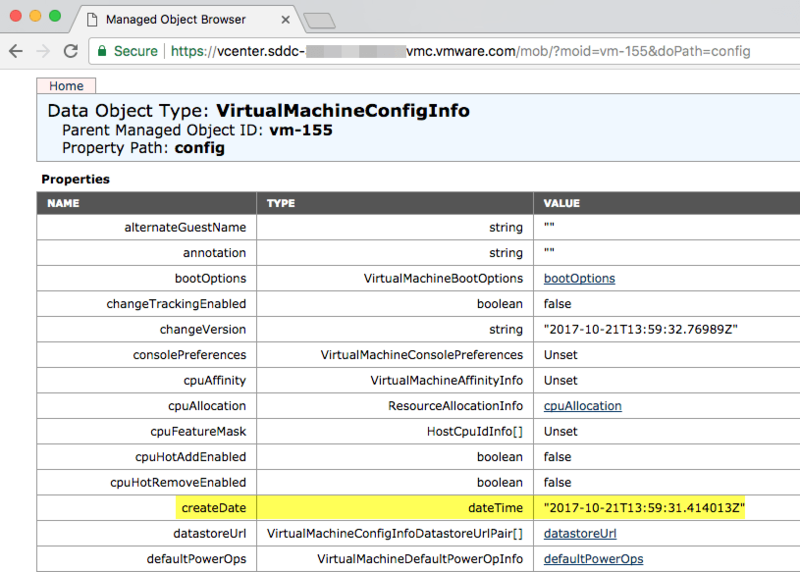 We have a requirement to assign ‘VM Creation Date’ tag to all Virtual machines in vCenter using VMware Tags. Any leads how We can accomplish this ? My idea is to create multiple dates as Tags under Category ‘Date’ and assign tags to Virtual machines. But this may have 365 tags for every year. Do you have any alternate solution for this apart from this ?